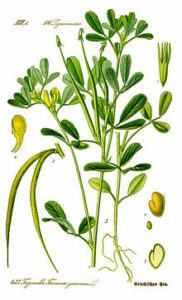 Fenugreek is one of the most commonly used galactogogues (supplements taken that are known to increase milk production). Fenugreek seeds (per 100 g) are rich sources of protein (46% of DV), dietary fibre (98% DV), B vitamins, iron (186% DV) and several other dietary minerals. The flavorful herb may be found in many Indian, Persian, Turkish, and Egyptian dishes. It is often the key ingredient in mother’s milk teas and lactation bars. Most mothers typically notice an increase in production 24-72 hours after starting the herb, but it can take two weeks for others to see a change. Some mothers do not see a change in milk production when taking fenugreek. Dosages of less than 3500 mg per DAY have been reported to produce no effect in many women. Interestingly enough, it’s been said if you want to know if you’re taking the correct dosage, you’re supposed to slowly increase the amount of fenugreek until your sweat and urine begin to smell like maple syrup. Got pancakes? However, like any herb or supplement, be aware of what you are injesting. Some people are allergic to fenugreek, specifically people who have peanut allergy and chickpea allergy may have a reaction to fenugreek. 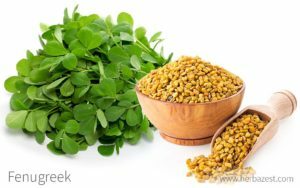 Fenugreek seeds can cause diarrhea, dyspepsia, abdominal distention, flatulence, perspiration, and a maple-like smell to urine or breast milk. There is a risk of hypoglycemia particularly in people with diabetes; it may also interfere with the activity of anti-diabetic drugs. It may interfere with the activity and dosing of anticoagulants and antiplatelet drugs. You should not take it if you are pregnant as it may affect uterine contractions and may be unsafe for women with hormone-sensitive cancers. In summary, those with thyroid, blood sugar issues (such as diabetes), peanut allergies and those taking certain blood clotting medications should avoid fenugreek. [Bingel 1991] Bingel AS, Farnsworth NR. Higher plants as potential sources of galactagogues, in Wagner H, Farnsworth NR, eds. Economic and Medicinal Plant Research, Volume 6, Academic Press Ltd, New York, 1994: 1-54. [Brinker 1998] Brinker F. Herb Contradictions and Drug Interactions. Sandy, OR: Eclectic Medical Publications, 1998, 70–1. [Dugue 1993] Dugue P, Bel J, Figueredo M. Fenugreek causing a new type of occupational asthma. Presse Med 1993 May 29;22(19):922. [Hale 2002] Hale T. Medications and Mothers’ Milk, 10th Edition. Pharmasoft Medical Publishing, 2002, p.277-279. [Huggins] Huggins KE. Fenugreek: One Remedy for Low Milk Production. [Korman 2001] Korman SH, Cohen E, Preminger A. Pseudo-maple syrup urine disease due to maternal prenatal ingestion of fenugreek. J Paediatr Child Health 2001 Aug;37(4):403-4. [McGuffin 1997] McGuffin M., Hobbs C, Upton R, Goldberg A. American Herbal Product Association’s Botanical Safety Handbook. Boca Raton: CRC Press, 1997. [Ody 1999] Ody P. Herbs to Avoid During Pregnancy from Herbs for a Healthy Pregnancy. Los Angeles, Calif: Keats; 1999. [Ohnuma 1998] Ohnuma N, Yamaguchi E, Kawakami Y. Anaphylaxis to curry powder. Allergy 1998 Apr;53(4):452-4. [Patil 1997] Patil SP, Niphadkar PV, Bapat MM. Allergy to fenugreek (Trigonella foenum graecum). Ann Allergy Asthma Immunol 1997 Mar;78(3):297-300. [Reeder 2011] Reeder C, Legrand A, O’Conner-Von S. The Effect of Fenugreek on Milk Production and Prolactin Levels in Mothers of Premature Infants. J Human Lactation 2011;27(1):74. Abstract only.